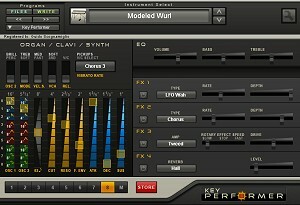 February 25, 2010 Key Performer updated to version 1.1 and now also available for Mac! Existing Windows users can download the update (just the installer, no need to re-download the sampled instruments) and overwrite the old version. Mac users can now take advantage of this nice and useful tool with cool keyboard sounds that cover all music genres and live situations. It's available as a plug-in in both VST and AU format and as a Standalone application. A COOL LOOKING NEW INTERFACE! And... the offer is once again extended until the end of this year!